← Happy 5th Birthday to my Blog! 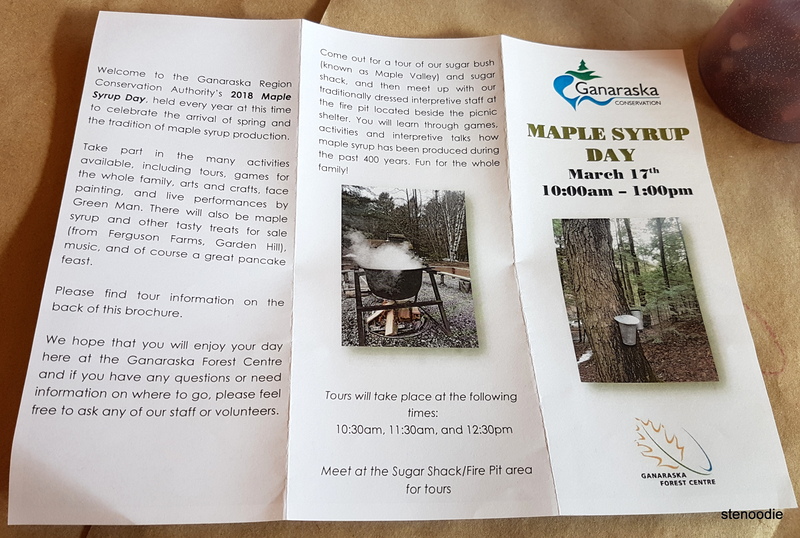 March 17, 2018 was Maple Syrup Day in Port Hope at the Ganaraska Forest Centre! It was my first time attending such an event and I was looking forward to seeing what was in store for us. 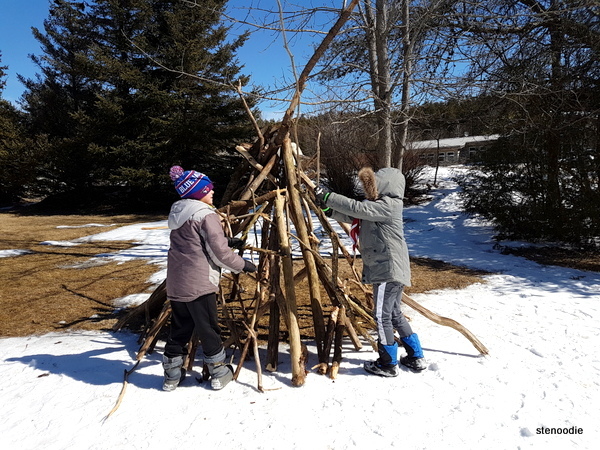 This was an absolutely made-for family friendly activity for the kids, and especially so as it was the last weekend for March Break. 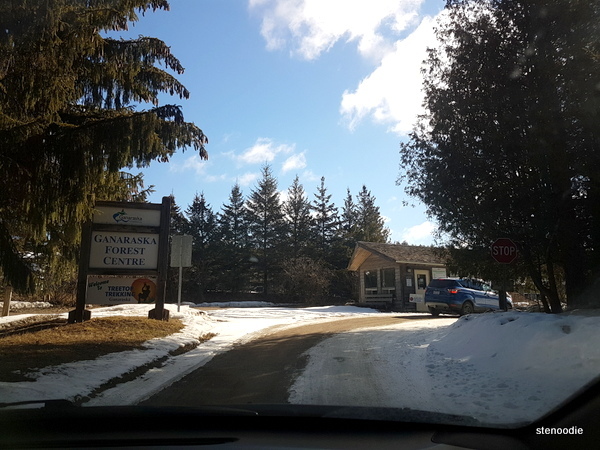 Ganaraska Forest Centre is located about 30 minutes north of Downtown Port Hope in Ontario (10585 Cold Springs Camp Rd). The Municipality of Port Hope had already reserved tickets for us. 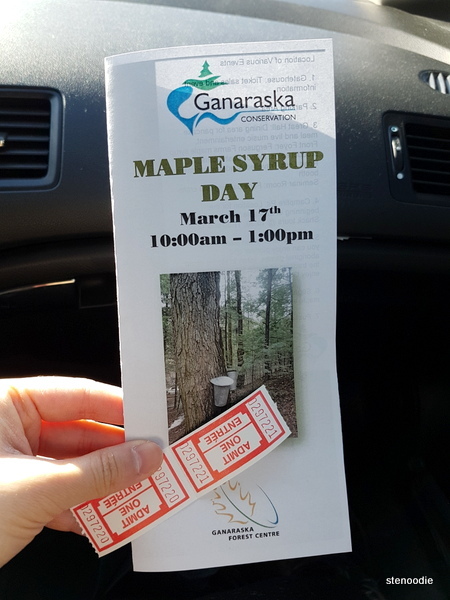 When we arrived and followed the signs to the parking lot, an attendant gave us two tickets for the pancakes. I was pleasantly surprised as I hadn’t expected there to be a meal for us! 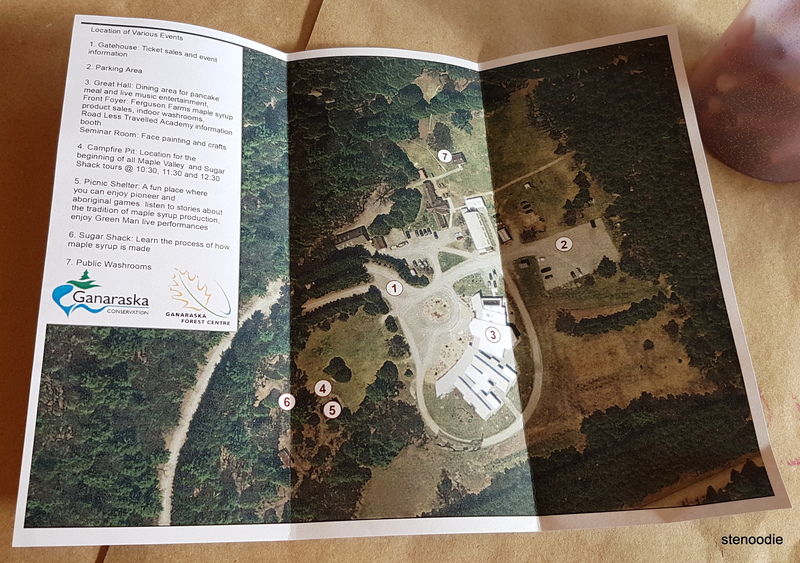 🙂 The pamphlet that we received also showed a map of the Ganaraska Forest Centre with clearly marked areas for the events and activities. 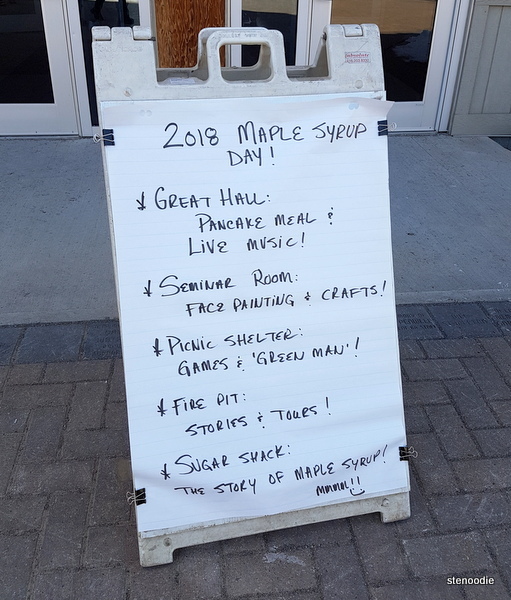 There were Sugar Shack tours every hour starting from 10:30 a.m. until 12:30 p.m. Once we parked our car, we followed the path and entered the Great Hall where there was live music playing and families already enjoying the hot pancake breakfast. 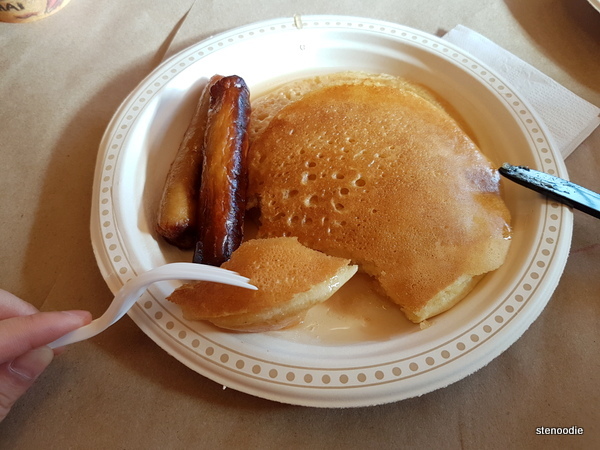 We took a seat as well and enjoyed our pancakes with maple syrup and sausages. 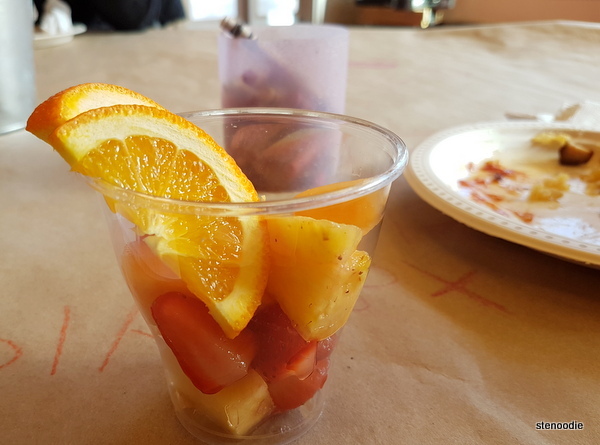 There were fruit cups too and orange juice, hot water, tea, and coffee. 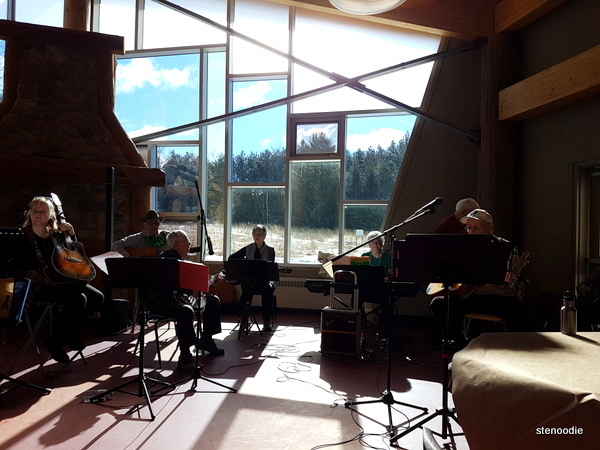 As it was St. Patrick’s Day, the band of musicians were playing some Irish music. 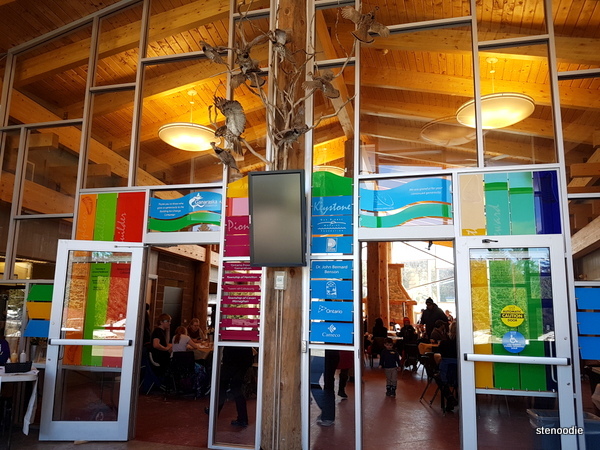 It was really nice to enjoy a late breakfast here. 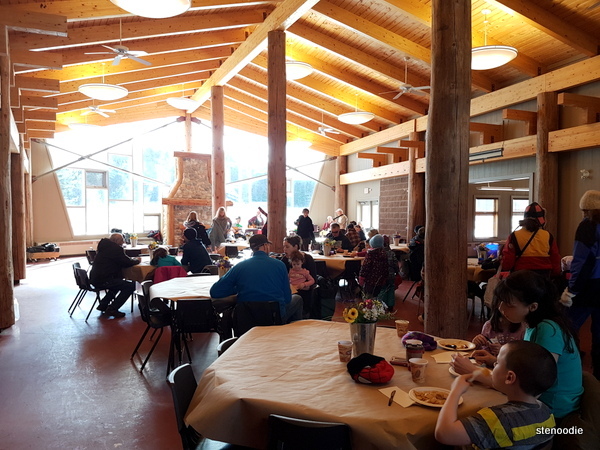 The space was huge and there were a lot of kids and families taking part in the arts and crafts happening in the adjacent room too. There was face painting and wood-painting. 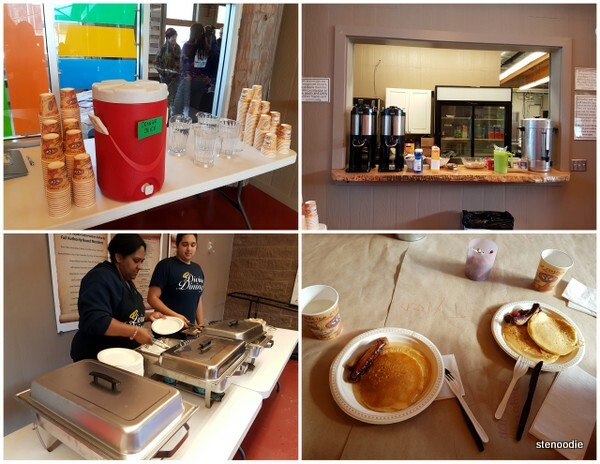 Pancakes, maple syrup, and sausage! 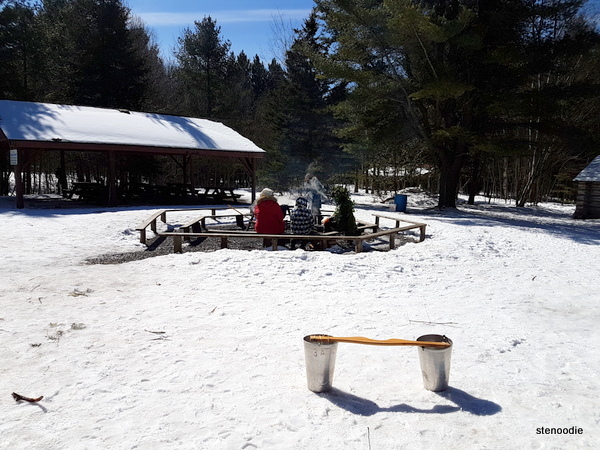 By 11:30 a.m., we went out to the fire pit to get ready to join the tour. 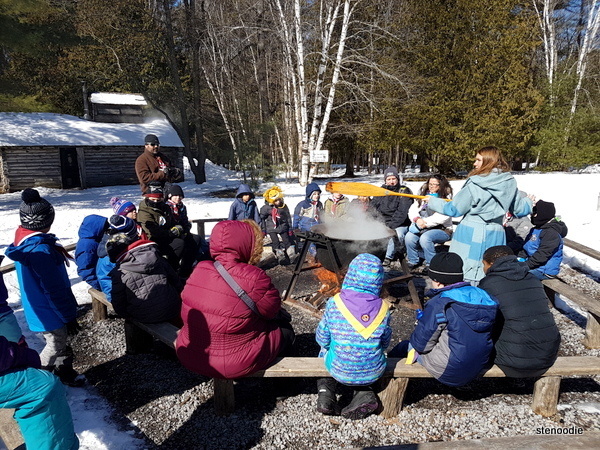 We sat down at the fire pit and heard from a staff member dressed up in pioneer gear about how pioneers first learned to make maple syrup. They took a heated rock from the pit of the fire and threw it into the trunk of a tree in order to heat up the sap. 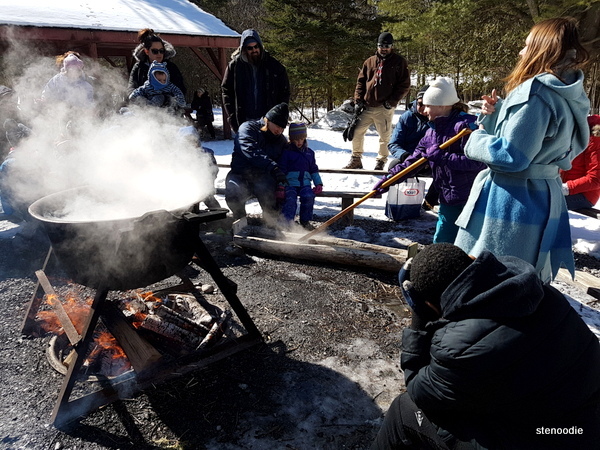 It was a slow process until the Europeans brought over metal to make a pot for boiling the sap over an open fire instead. 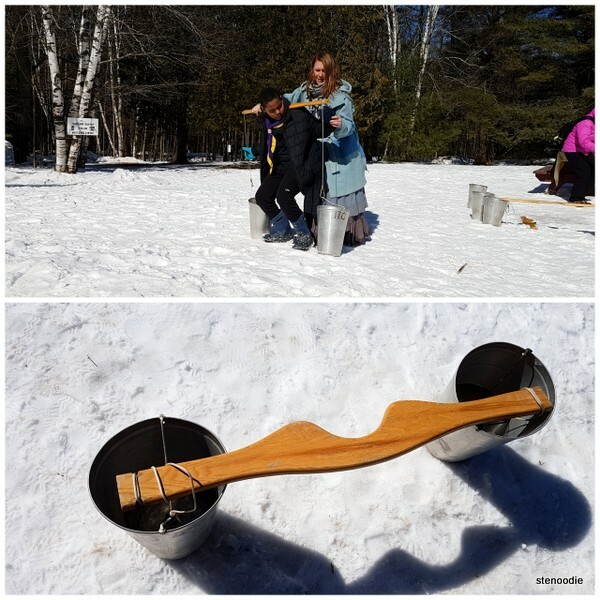 We also saw a demonstration of how the pioneers would carry the sap back and forth. 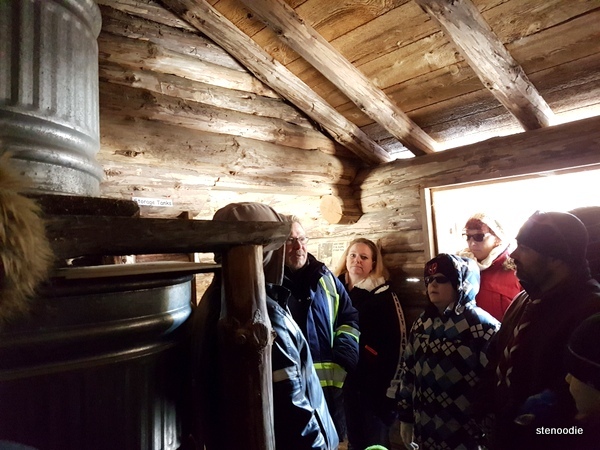 After this storytelling, we entered the Sugar Shack cabin with an evaporator and also got to taste some maple syrup. 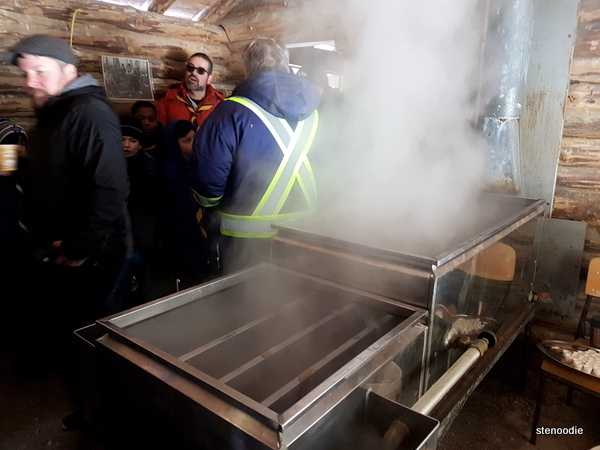 The man did a great job at explaining how the boiling process evaporated the excess water out of the sap to make maple syrup. 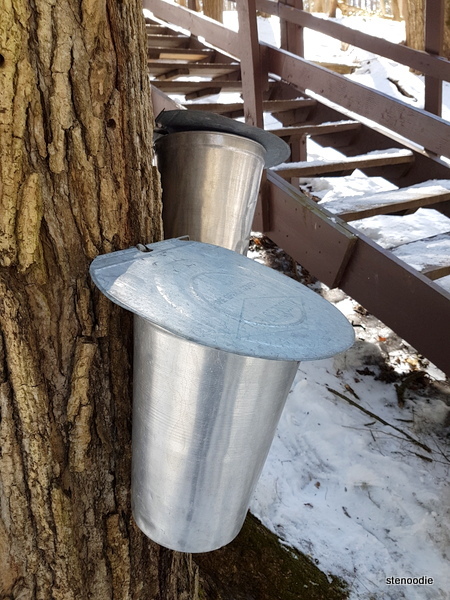 He showed us the tools that were used as well to check that the maple syrup had evaporated enough or not. 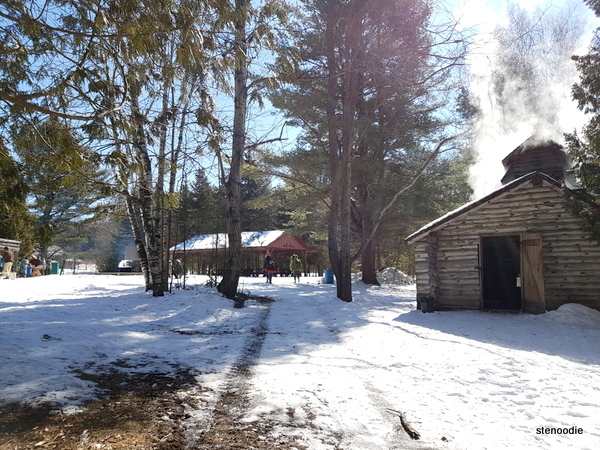 I liked smelling the sweet steam coming out of the evaporators. 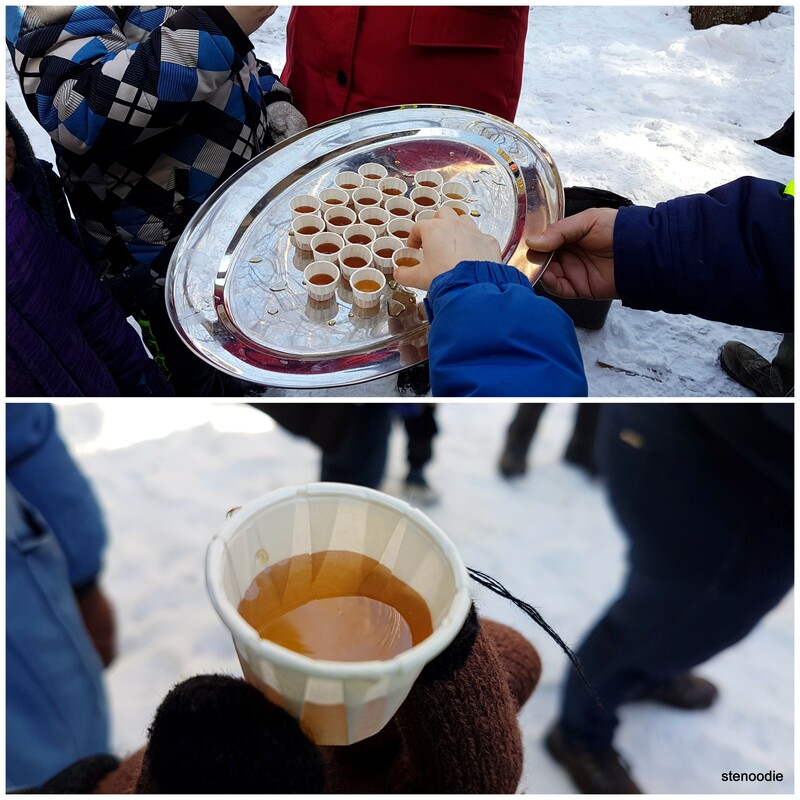 The evaporating sap was very sweet indeed. 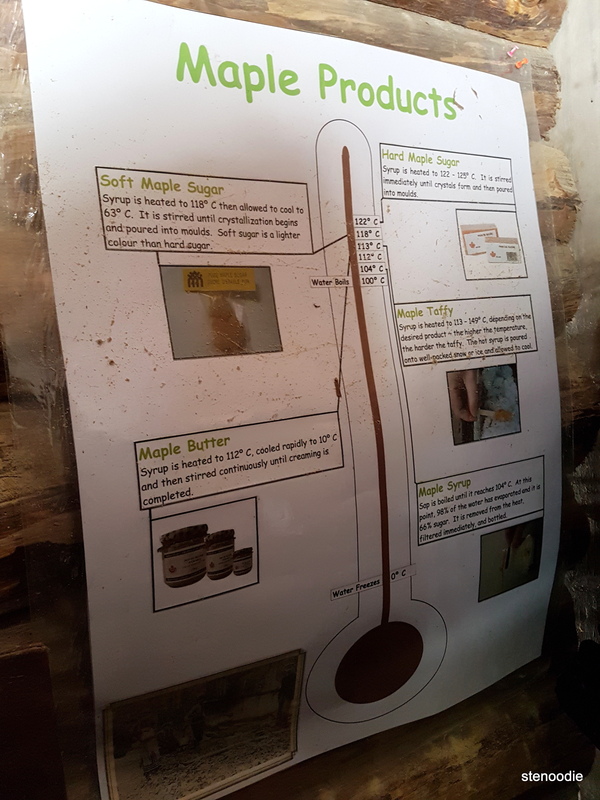 Maple products. 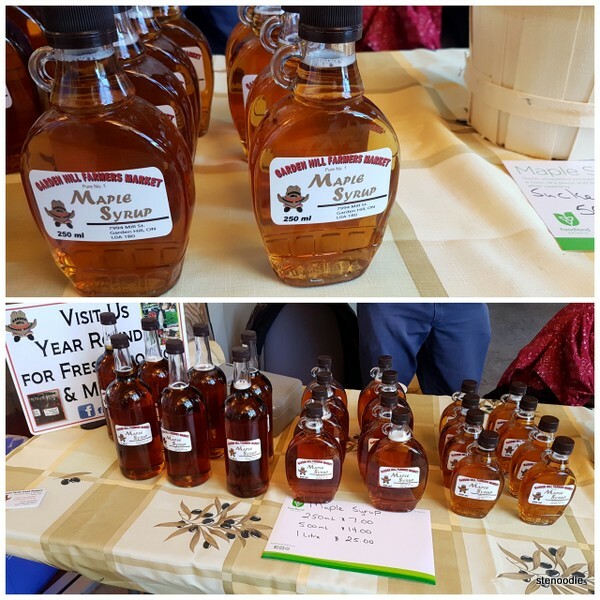 I want to try maple taffy! 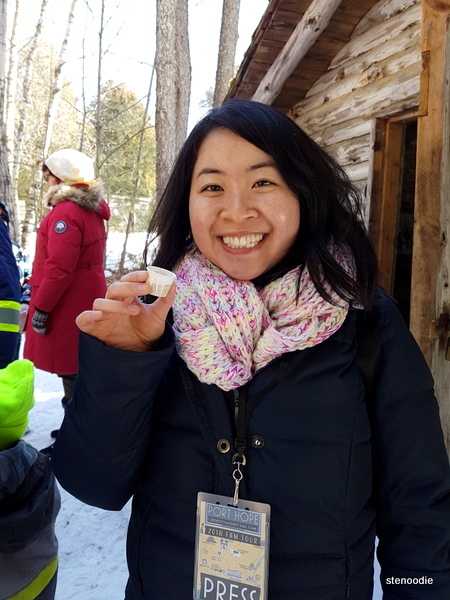 We realized after exiting the cabin that we had actually joined in another tour and realized the actual Sugar Shack Tour went another route. 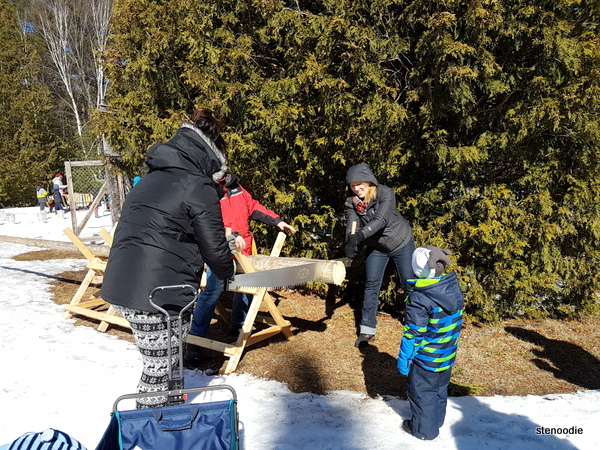 Thus, we then went down to the clearing by the water where there was a set-up for a lesson on drilling holes into maple tress. 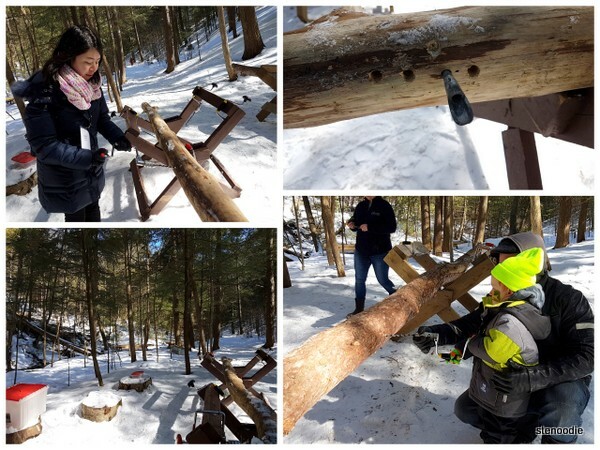 We tried our hands at drilling a hole into the bark of a (already dead) maple tree to see what it would have been like to drill for sap from a tree. It was harder than it looked but fun to try. It was also a pleasure to meet Amanda from the Municipality at this time too! 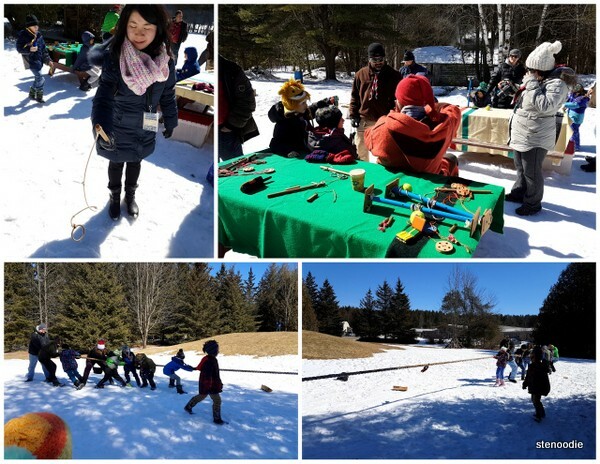 Before we left the premises, we enjoyed some pioneer and Aboriginal games that were laid out on the picnic tables. We also watched some kids play a round of tug of war. 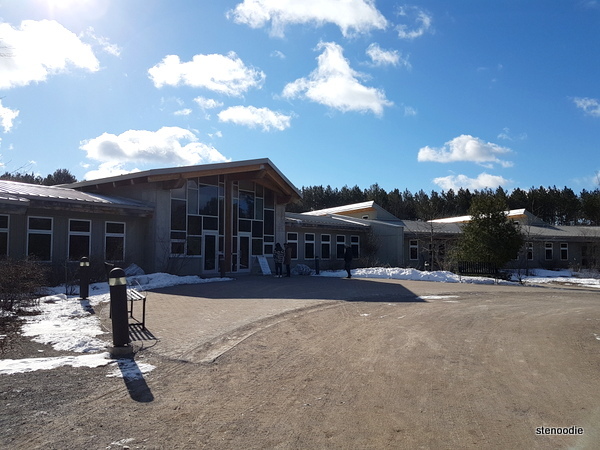 FTC Disclaimer: Although the Municipality of Port Hope reached out and invited me to a complimentary visit to promote the businesses in Port Hope, the opinions expressed here represent my own and not those of the Municipality or businesses. 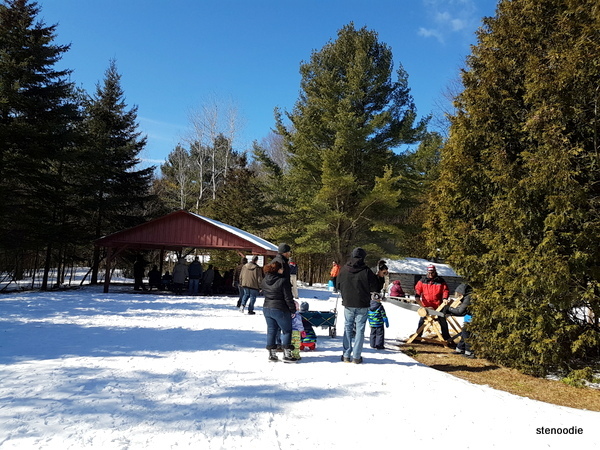 This entry was posted in Complimentary Adventures, New Experiences and tagged #OntariosFAVsmalltown, 10585 Cold Springs Camp Rd, @GanaraskaFC twitter, @porthopeontario twitter, @VisitPortHope twitter, Campbellcroft, family events, family friendly, Ganaraska Forest Centre, Ganaraska Forest Centre Great Hall, maple syrup and pancakes, Maple Syrup Day, Maple Syrup Day 2018, Maple Syrup Day 2018 info, Maple Syrup Day Ganaraska, Maple Syrup Day Port Hope, maple syrup pancakes, pancakes and sausages, Port Hope, Port Hope fun things to do, sugar shack tours, using an evaporator to make sap. Bookmark the permalink.